Danielle Redlick the estranged wife of UCF faculty member, Michael Redlick denies murdering her husband- insisting the man stabbed himself to death. 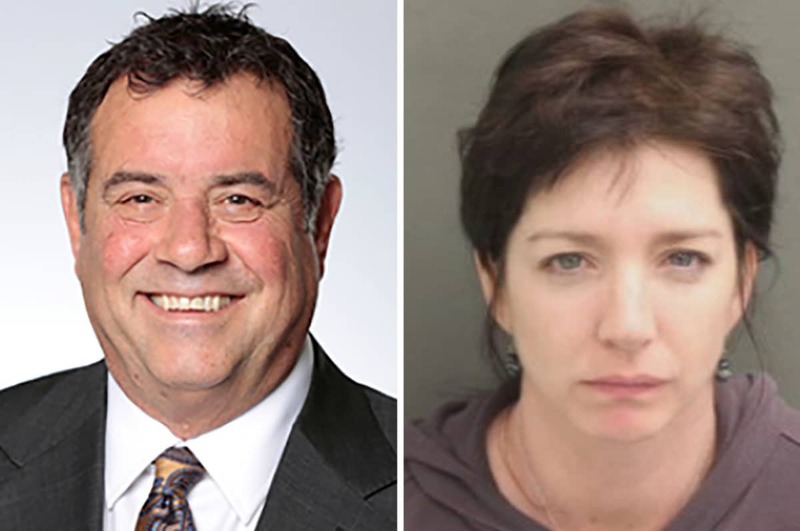 The estranged wife of a University of Central Florida faculty member and former Memphis Grizzlies executive facing murder charges has denied stabbing her husband to death in Orlando last month. Danielle Justine Redlick’s assertion comes despite the 45 year old woman waiting roughly 11 hours before calling police on Jan. 12- to report that her husband, Michael Redlick, 65, allegedly stabbing himself during an argument that she said started when he spat a piece of a McDonald’s hamburger into her face, according to a charging affidavit obtained by the Orlando Sentinel. Adding heightened contention to the veracity of Danielle Redlick’s defense is the police saying the estranged wife checking messages on a dating app before calling authorities. Redlick told authorities she grabbed a serrated knife from the couple’s kitchen before her husband snatched the blade from her and ‘began making stabbing motions toward himself,’ according to a Winter Park police sergeant’s report. Redlick then ran to a bathroom, she said, and locked the door. She exited the bathroom when she heard her husband of 13 years not making any more noise and found him motionless on the floor. Unable to find a phone, Redlick said, she started slipping on pools of her husband’s blood, prompting her to grab some towels and try to clean up the gruesome scene, records show. Redlick said she ultimately collapsed next to her husband while trying to revive him, recalling later that she ‘remembering lying next to the victim thinking ‘what am I going to do,” Winter Park Sgt. Lisa Supat wrote. Redlick said she awoke the following morning and called police after another crack at cleaning up the couple’s residence, some 11 hours after the violent encounter, according to the affidavit. But Redlick’s story quickly unraveled, according to detectives, as she somehow managed to find time to check her messages on a dating application called MeetMindful roughly two hours before she called police. She also told authorities that she didn’t call police immediately after the confrontation because she couldn’t find her phone, according to an affidavit. Police arrested Redlick at the couple’s home on Temple Drive early Wednesday. She asked for an attorney and did not make any statements to police. Cited court records indicate Redlick filing for divorce from Michael Redlick — UCF’s director of external affairs and partnership relations for the DeVos Sports Business Management Program — in March 2018. But a judge dismissed the petition in November, ruling that Michael Redlick had not been properly served with divorce papers. Danielle Redlick also sought custody of the couple’s two children, ages 15 and 11, as well as alimony and ‘exclusive use’ of the couple’s home on Temple Drive. Danielle Redlick — whose occupation was listed as an unemployed communications professional and photographer — also sought to drop Redlick’s surname and revert to her maiden name of Drohan, the Sentinel reports. Cited records indicate that a friend of the couple told police that they had a ‘rocky’ and ‘toxic’ relationship. Another friend said Danielle Redlick would become volatile and angry when intoxicated. Redlick also tried to hurt herself after her husband’s death and medical records indicate she had alcohol in her system at the time, which would constitute a violation of her probation from a January 2018 arrest for resisting an officer without violence and disorderly conduct in Seminole County, according to the Sentinel. Neighbors of the couple, meanwhile, said details of Redlick’s death had been elusive since last month. Of damning note- a medical examiner ruled Michael Redlick’s death as a homicide, adding that his stab wounds did not appear to be self-inflicted. Wounds to his face and shoulder were so significant that he would’ve died within five to six minutes, according to the station. Redlick, who had been employed by UCF since 2013, had also worked for the Memphis Grizzlies. Michael Redlick had also previously worked for the Indianapolis Motor Speedway and the Cleveland Browns, according to the Orlando Sentinel. Danielle Redlick remained held without bond as of Thursday at the Orange County Jail on charges of second-degree murder and tampering with physical evidence, jail records show.